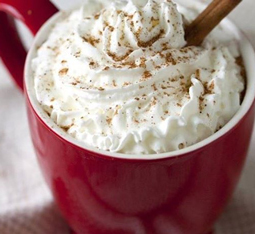 Pumpkin Pie Latte - A recipe from Savor California, the online showcase for extraordinary gourmet foods and beverages from California. In 2-quart saucepan, heat milk, pumpkin syrup and sugar over medium heat until hot – do not boil. Remove from heat. Stir in 1/2 teaspoon pumpkin pie spice, the vanilla syrup and coffee. Pour into 2 large mugs. Garnish each with whipped cream, a dash of pumpkin pie spice and a cinnamon stick.